All of my training and experience has taught me that a word-for-word translation is a siren. It has superficial appeal in that intuitively it seems to bring a reader closer to a foreign text, but, in fact, it misconveys the original text. Still, I also believe that it’s important to understand both sides of a debate. 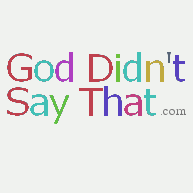 So what might the value of a word-for-word translation of the Bible be? The best answer I can think of is this: if the importance of the Bible lies in the actual words and not in what those words do — meaning, poetry, etc. — then a word-for-word translation is better than a translation that captures the meaning and poetry and so forth. I have always tacitly assumed that the primary point of the Bible’s narrative text was to convey meaning, the point of the poetry to be poetic, and so forth. But that may not be so. In fact, the evidence we have from antiquity is that the words were more important than what they meant. This is why, for example, the NT frequently quotes the words of the OT out of context. (The early-first-millennium collection of Jewish writing known as the Midrash does the same thing.) Modern readers sometimes see this approach as deceptive, but ancient readers would probably be baffled by our modern insistence on quoting meaning instead of quoting words. So it’s not a crazy idea to suggest that the words themselves are what’s important. What other value can you find for a word-for-word translation? What is the Dust of the Ground from which Man is Formed? Genesis 2:7, according to the KJV, has the creation of man “from the dust of the ground.” But why “dust”? From Genesis 2:7, we know that it’s something on the ground, but we don’t know what. “Dust” is a possibility, just from this verse, but — again, just from this verse — so is “grass,” “rocks,” “lichen,” “mud,” etc. So we look further. Genesis 13:16 helps us a little. There we read that Abram’s descendants will be like the afar on the earth, so that if the afar can be counted, so can Abram’s descendants. So afar can’t mean “mud” or “clay.” It seems to refer to particles of some sort. Genesis 18:27 is helpful in a different way. There we see afar used as a metaphor of humility. (The full phrase is “afar and efer.” I’ve explained elsewhere that the English “dust and ashes” doesn’t do justice to the repetition of sounds in afar and efer: “Doublets Are Part And Parcel of Bible Translation.”) I Samuel 2:8 emphasizes the connotation of lowliness: God “raises the poor from afar, lifts up the needy from the trash.” And the vivid imagery of Isaiah repeatedly uses afar to represent humility. The basic problem is this: “Dust” in English refers specifically to particularly fine-grained particles, of earth or otherwise. “Dirt,” by contrast, is just what’s on the ground, and we seem to be talking about dirt here. In Numbers 5:17, the priest is instructed to take afar form the floor of the Tabernacle, so again afar seems to be “dirt,” not “dust” Dust would have been swept away as part of regular cleaning (I presume). In Greek for afar we usually find gi, a word that pretty clearly means “land,” both in the sense of “dirt” and of “country.” So in addition to its use as the substance that filled the wells, we read that Jacob lived in the gi of his ancestors, the gi of Canaan (Genesis 37:1). The Greek gi also means “(the entire) Earth,” a usage we find, for instance, in Genesis 6:11. But then in the very next verse, “other stones” and “other afar” are supposed to be used to rebuild the house. (I don’t know of any English translation that uses “dust” here.) Is this just poetic symmetry? (Leviticus 14:40 refers to stones, so both “stones” and afar in 14:42 might refer to that which was discarded.) Or does afar also metonymically refer to “plaster,” made from earth and water? This latter possibility is consistent with Leviticus 14:45, where houses seem to be made of “wood, stones, and afar.” Or, perhaps, is the idea here that new stones, wood, and dirt are supposed to gathered, and then worked in the way that stones, wood and dirt usually are? In 2008, as I was writing And God Said, I described the King James Version (KJV) as the “fool’s-gold standard” of English Bible translation. That was approximately 397 years after the watershed publication of the KJV, hardly a date worth noticing. But today the KJV turns 400, and with that anniversary has come renewed world-wide attention to what certainly ranks as one of the most important and influential translations of the Bible ever. But some of the celebration is misplaced. 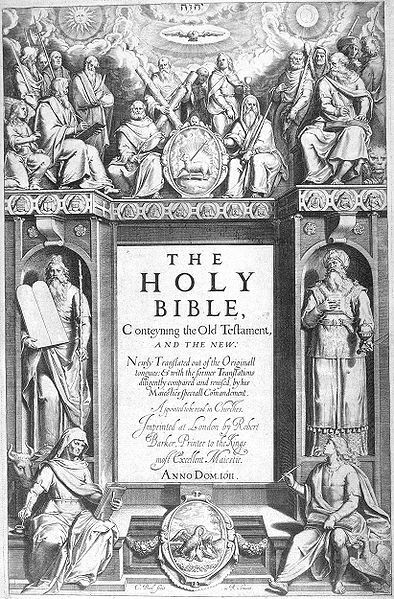 Yet for all its merits, the King James Version is monumentally inaccurate, masking the Bible’s original text. There are two reasons for the errors. The second reason is that the KJV was written several hundred years before the advent of modern translation theory, linguistics, and, in general, science. Just as advances like carbon dating and satellite imagery help us know more about antiquity now than people did 400 years ago (even though they were a little closer to the original events), we also know more about ancient Hebrew and Greek now than they did 400 years ago. In fact, we know much more, both about the ancient languages and about how to convey them in translation. 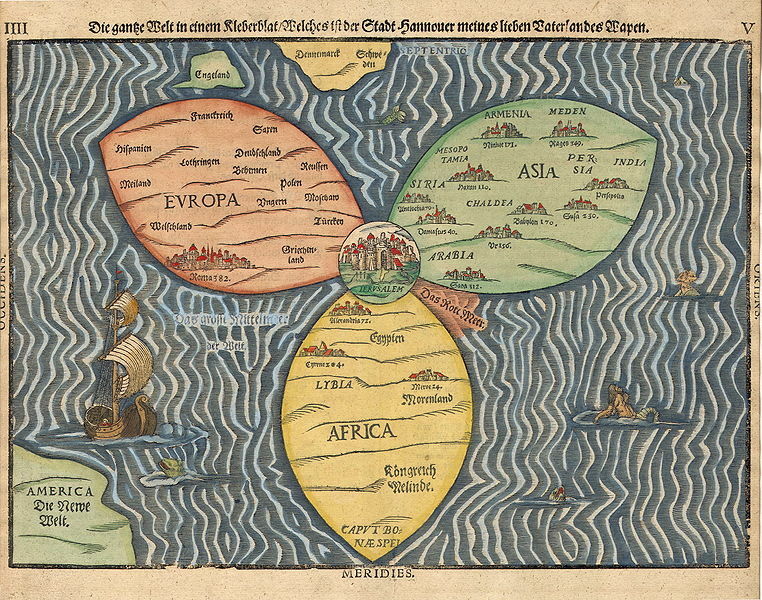 Like Heinrich Bunting’s famous 16th-century “clover-leaf map” of the world that adorns my office wall (the map puts the holy city of Jerusalem right in the middle, surrounded by three leaves: Europe, Asia, and Africa), the KJV translation is of enormous value historically, politically, sentimentally, and perhaps in other ways. But also like Bunting’s map, the KJV is, in the end, not very accurate. And those who would navigate the Bible solely with this 400-year-old translation journey in perils.